The shutdown of a homeless camp in Tucson is almost complete. Camp Bravo, on the edge of Tucson's Santa Rita Park, began three years ago as a place to house homeless veterans, though it houses non-veterans, too. Officials say code violations and neighborhood complaints shut the camp down. Bravo Base began about three years ago as a place for homeless veterans. Organizers said the vets felt togetherness as if they were back in the military. The camp would take in other homeless and feed homeless people in the neighborhood around Santa Rita Park, but the city of Tucson says the camp's a health and safety hazard that violates the city's building code so it's under orders to fold its tents and move out. 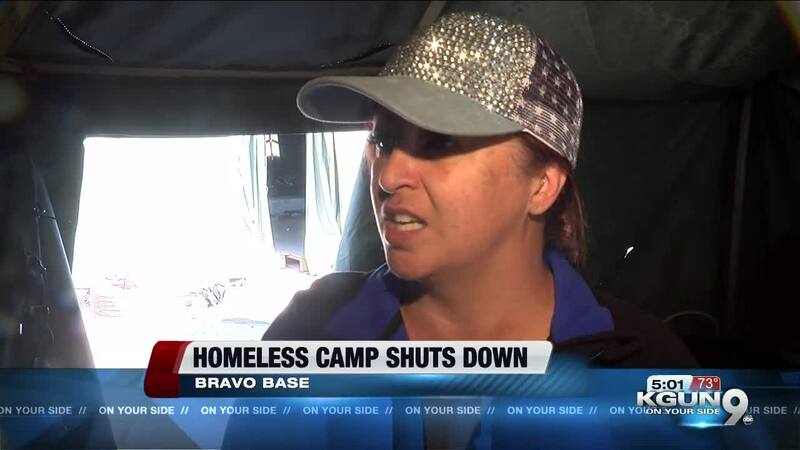 Addie Mendoza says she went from two years of volunteering at Bravo Base, to managing it. "It's definitely better than sleeping under the bridge, in the tunnels and not knowing who's coming at you or who's going to hurt you, who's going to steal your things," she said. "This was a safe place for them." Organizers say they had, at the peak, around 72 people in the camp. That would have been at the coldest part of the winter. At the time of the eviction notice, they had 42 residents -- 22 of whom were veterans. The camp was just south of neighborhoods in Councilmember Steve Kozachik's Ward 6. He says the city worked with the property owner for quite a while to clear the camp, and now there's a plea agreement that drops fines against the property owner in return for closing and cleaning the site. "Understand, though, that we are offering all the people in the camp services that they need," Kozachik said. "So this is not an inhumane or heartless move by the city. It's something that's been a long time coming and we are doing everything that we can to make sure that the people in the camp have the services that access to the services they need." But camp organizers worry shelters won't let homeless people stay with spouses or pets, or have the spirit they felt at the camp.